The stigma around marijuana use, both medical and recreational, is slowly dwindling as states throughout the country work towards marijuana legalization. 33 states have officially declared medical marijuana use legal and 10 states have legalized recreational use of the drug. However, a question lingers nationwide regarding views of marijuana in the workplace. All companies hold the right to drug test their employees; however, some industries feel that it’s necessary to test for marijuana regularly while others don’t. Currently, research shows that the older workforce has more of a negative outlook on marijuana use in the workplace. 46% of employees over 30 said they would lose confidence in coworkers who smoked marijuana, even in states where recreational use is legal. With a younger workforce taking over, attitudes towards marijuana use will surely change as time goes on. However, it’s important to understand the current outlook on this topic when hunting for a job or trying to keep the one you currently have. We surveyed 1,000 Americans and found that 1 in 5 said they would decline a job offer if they knew the company drug tested. In fact, the younger generation of respondents aged 18-24 were more likely to pass on an offer. Becoming knowledgeable on how marijuana use can affect your job is essential to staying safe, responsible and employed for the long-term. 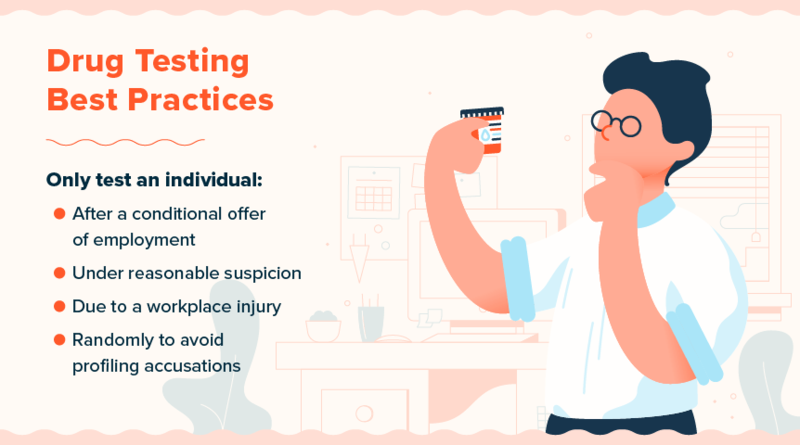 It’s also important for employers to understand the best practices when it comes to drug testing and what employees of today and tomorrow expect. Drug testing in the workplace began in the mid-1980s when the Reagan Administration began the War on Drugs program. By 1988, there were Drug-Free Workplace regulations in place which required any federal company with a contract over $25,000 to be completely drug-free by testing employees. While this only applied to the public sector, private companies saw the value in the Drug-Free Workplace movement as well and put the program in effect. In present day, the majority of these programs have remained in effect with about 90% of Fortune 1000 companies and 62% of all employers in the United States having mandatory drug testing programs. Many states will reward companies for putting drug testing programs into place by giving discounts on workers’ compensation premiums. 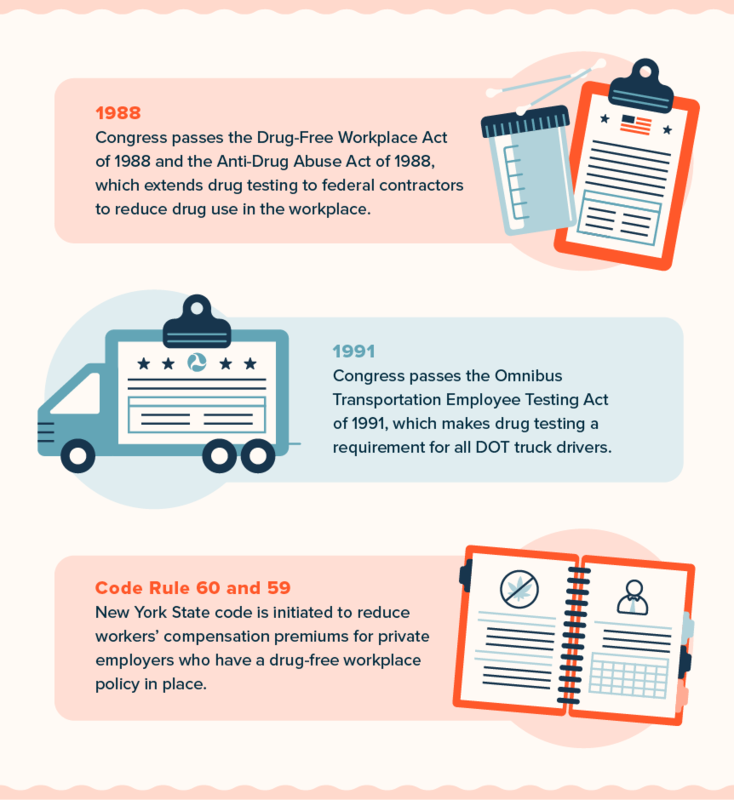 1988 – Congress passes the Drug-Free Workplace Act of 1988 and the Anti-Drug Abuse Act of 1988 which extends drug testing to federal contractors to reduce drug use in the workplace. 1991 – Congress passes the Omnibus Transportation Employee Testing Act of 1991, which makes drug testing a requirement for all DOT truck drivers. Code Rule 60 and 59 – New York State code is initiated to reduce workers’ compensation premiums for private employers who have a drug-free workplace policy in place. There are many industries that are notorious for drug testing, including the transportation industry, the construction industry, the sports industry, the military and the medical industry. These industries all have very specific reasons for sticking to their drug testing policies, regardless of expansion in legalization and more liberal viewpoints on marijuana use nationwide. For the transportation and construction industries, marijuana use can be seen as a safety risk. These are both industries in which the utmost focus and care is needed to operate heavy machinery and equipment. Companies can’t risk having their employees under the influence of any drugs — legal or illegal. In the military, safety is also a big concern because soldiers are operating heavy machinery and deadly weapons. If active duty members are not on the front lines, they may be working with computers and focussing on strategic operations. Regardless, members of the military are entrusted with our country’s well being, meaning strict drug testing policies will remain in place. Athletes are drug tested because they are paid to perform based on their natural abilities. Marijuana and other drugs can affect an athlete’s ability to do their job both positively and negatively. Athletes sign contracts when joining a team agreeing not to do drugs, so if they are drug tested and fail, they can face dismissal, suspension or a heavy fine. Depending on what job you apply for in the medical industry, you may or may not get drug tested for marijuana. However, most medical professions are strict with drug testing because these positions give access to prescription medications of all sorts. Hospitals and medical companies want to employ drug-free people to ensure they can trust their employees around these substances. On the flip side, there is a large number of companies that don’t drug test as heavily — and that number is growing. With drug tests costing companies around $30 to $50 per employee, many see it as a wasted expense. Quest Diagnostics said that failed drug tests reached an all-time high in 2017 and this is likely to increase as legalization becomes more widespread. Drug testing restricts the job pool, meaning companies aren’t able to find the best candidates for open positions. We see more liberal companies such as Google, Twitter, Whole Foods, NPR and Red Bull already adopting a new mindset by eliminating employee drug tests. 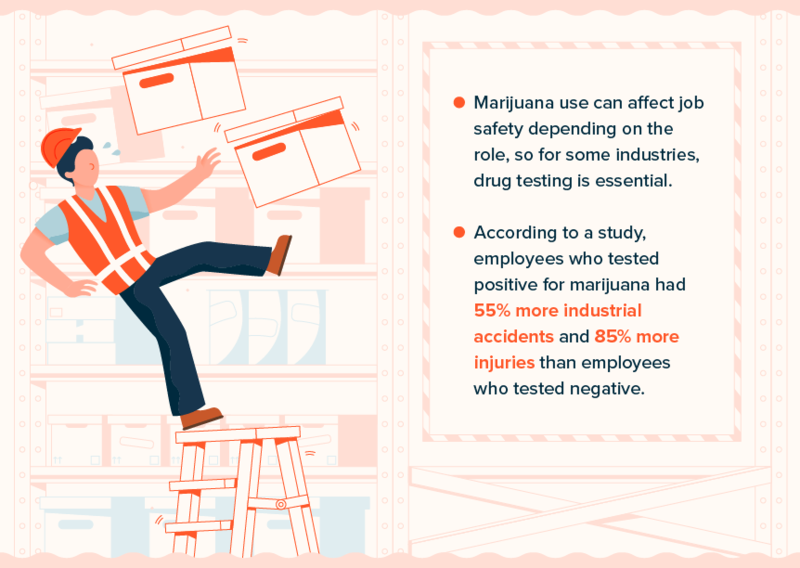 How Does Marijuana Use Impact Job Safety? Marijuana use can affect job safety depending on the job role, so for some industries, drug testing is essential. As mentioned above, the transportation and construction industry as well as the military, all have very viable reasons for drug testing employees and members. A study done by the National Institute on Drug Abuse reported that employees who tested positive for marijuana had 55% more industrial accidents and 85% more injuries than employees who tested negative. Marijuana users in industrial fields also had decreased productivity, more workers’ compensation and unemployment compensation claims, and more lawsuits. It’s clear that some industries are better off keeping their drug policies in place as a way to protect both a company and its employees. It simply depends on what type of work is being performed and whether employers feel marijuana will hinder an employee’s work performance. Can I Be Fired for Smoking Marijuana Legally? Medical and recreational marijuana legalization has prompted many employees to wonder if they can be fired for smoking marijuana off the job —this is a valid concern. In states where cannabis is legal, companies still have the right to fire employees for their marijuana use if employees agree to drug-free company policies when taking the job. Maine is the only state that currently protects recreational marijuana use outside of the workplace. When it comes to medical marijuana use outside of the workplace, states are divided and you’ll have to check your specific state’s laws to see if you’re protected or not. You can find a detailed guide on state laws for off-duty marijuana use here. You should definitely be aware that all companies have the right to fire employees for being under the influence while at work, even if they possess a medical marijuana card. 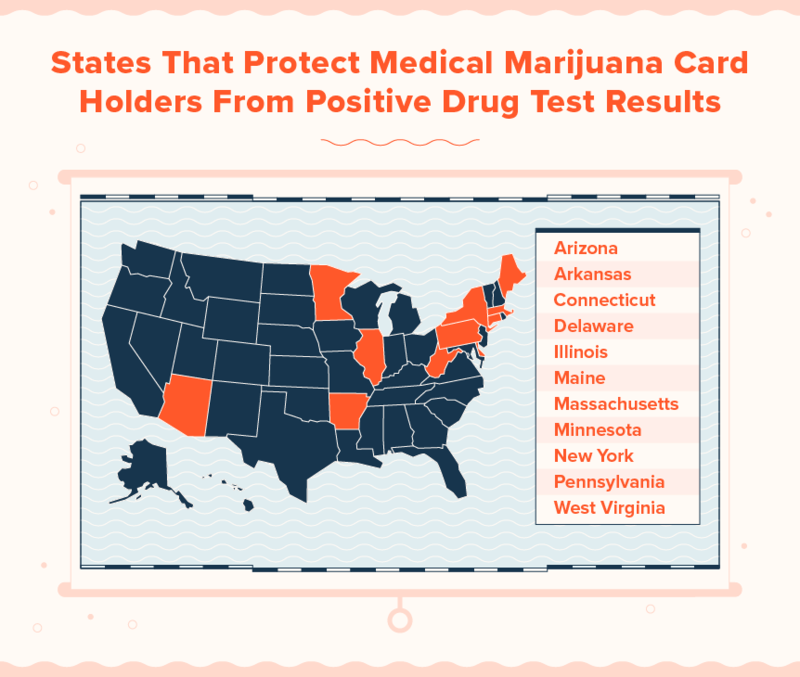 Many states do, however, protect medical marijuana cardholders from positive drug test results upon hiring. Some of these states include Arizona, Arkansas, Connecticut, Delaware, Illinois, Maine, Massachusetts, Minnesota, New York, Pennsylvania and West Virginia. A recent federal court case in Connecticut verified this guideline when the court ruled that under what is known as the Connecticut Palliative Use of Marijuana Act (PUMA), the company should not have refused to hire an employee because of their medical marijuana use. Should You Be Open About Your Marijuana Usage? While you may be confident that your company is a liberal environment where medical and/or recreational marijuana usage outside of the workplace is protected, you still may be wondering whether it’s okay to talk about smoking when in the office. 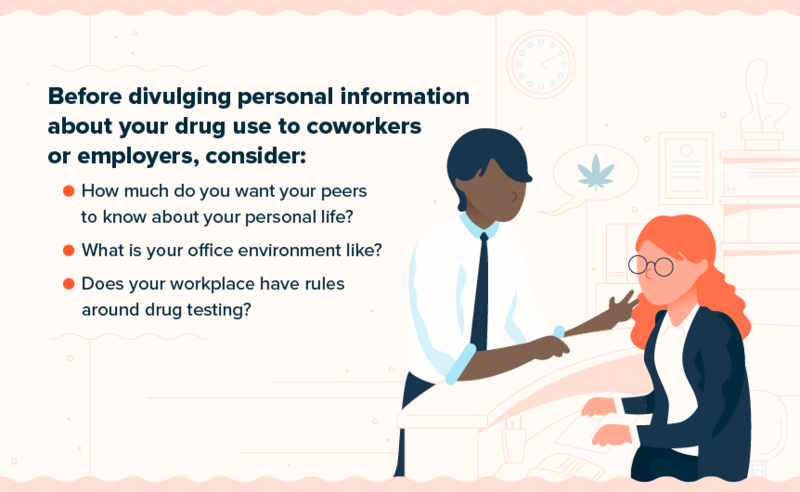 Before divulging personal information about your drug use to coworkers or employers, you should ask yourself the following important questions. How much do you want your peers to know about your personal life? Just like any other personal life topic, talking about your marijuana use in the office is a private subject that should only be discussed with peers you’re comfortable around. Would you tell these same peers personal details about your social life, relationship or any other daily habits you partake in? This may be a good way to gauge whether or not it’s appropriate to discuss your marijuana use with them. Also flip the script and observe how much your peers are telling you about their personal lives — this will help you decide what’s suitable to reciprocate on your end. What is your office environment like? Having a liberal office environment that protects your marijuana use outside of work doesn’t necessarily mean discussion of marijuana usage inside the office is welcome. Before being open about your usage, determine what your office environment is like and whether this is appropriate. Are you in a social atmosphere where you and your coworkers gossip frequently? Or is it more of a heads down and focused type of workplace? The environment will either open the door for a discussion on marijuana or it won’t. Does your workplace have rules around drug testing? Clearly, if your company has drug testing policies in place, this is not the type of workplace where you want to talk about your marijuana use. Even if you’re protected by state laws, it’s best not to mention it and keep your personal habits outside of work. It can come off as disrespectful if you know your company’s policies and choose to talk about things that go against them. When in the office, you should have no trouble remaining quiet about your cannabis usage. The universal practice for many companies nationwide in regards to drug testing is only to test an individual after a conditional offer of employment, under reasonable suspicion, due to a workplace injury or randomly. Employers typically have more leeway to test new applicants than they do to test current employees. In some states, employers are not allowed to conduct routine or random drug testing of employees who are already working for the company unless there is reasonable suspicion. When trying to gauge reasonable suspicion, a supervisor should observe an employee’s physical appearance, speech and smell, which can be indicators of being under the influence of drugs and/or alcohol. Actions of the employee and employer should be well-documented and the supervisor should speak with the employee about his or her behavior by mentioning their change in job performance. A drug or alcohol test can then be performed. For post-injury drug screenings, the drug or alcohol test should be administered within 24 hours of the injury occurrence. Employers should always remain consistent in upholding drug and alcohol policies in the workplace, regardless of the specific employee and/or incident. If a test comes back positive for drugs or alcohol and the workplace has a zero-tolerance drug policy, the employee should be dismissed and given no special treatment. Alternatively, an employee cannot be dismissed on the grounds of being under the influence if a drug test comes back negative. While it’s clear that some industries have drug policies in place for safety reasons, the majority of the workforce is moving toward a more accepting mindset in regards to marijuana. Companies still have the right to restrict marijuana use within the workplace, but if being drug-free is an important part of workplace policy, it should be made very clear from day one — especially to younger employees. Revisiting drug policies and making policies clear can lead to an increase in company budget, a larger applicant pool and less employee turnover. As long as marijuana use, especially medically, doesn’t negatively affect the safety of employees or the clients they work with, removing this restriction can reduce the stress that employers feel throughout the hiring process and in the enforcement of the policy long-term. The younger workforce will be happy to know that as states begin accepting marijuana legally, the corporate world may be starting to follow suit. Whether you’re an employer or an employee learning more about medical marijuana will help you stay informed.